You can either buy my eBooks directly from my publisher from this page or from retailers such as Apple iBooks and Amazon Kindle (selected volumes only). Please note that if you buy direct you will automatically have access to all available formats including Kindle and iBooks. Click here for a comparison of the eBook formats or here for a catalogue of volumes available on Apple and Amazon. Please note – You can also preview and purchase individual volumes from Part 1 and Part 2 separately. Please click here to view a full listing of individual volumes. Buy Part 1 of Practising the Piano (three volumes) for 30% off the individual volume prices. Buy Part 2 of Practising the Piano (three volumes) for 25% off the individual volume prices. Buy Part 3 now or find out more here. Buy Part 2 (in three volumes) and Part 3 (single volume) of Practising the Piano for a further 20% off the combined price of the individual bundles. 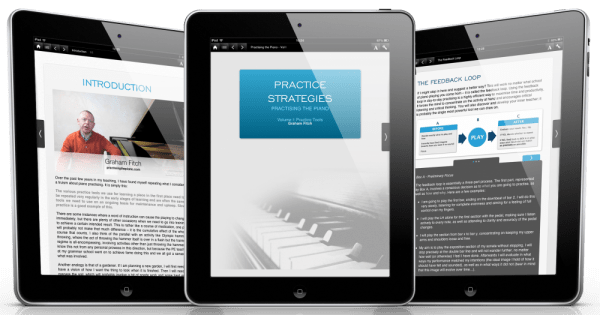 Buy all three parts of Practising the Piano for 15% off the combined price of the individual bundles. If you have a voucher please enter it in the box provided below.